I was also very fortunate to spend some time with the designers for Dos Caras who specialize in bathing suits as well. Their line was filled with high waisted, vibrant colored pieces for every body type. I can’t wait to share more of their inspiration, Spring 2014 line, and their plans for Fall 2014. Huge kudos also goes to the collaboration between Fashion Week San Diego and the Rancho Coastal Humane Society who put together a “Doggie Fashion Show.” This was an opportunity to showcase dogs that are ready for adoption by giving them the opportunity to wag their tales down the runway in hopes of finding a permanent home! This tactic was most effective as I almost came home with a brother for my current four legged child Daisy. 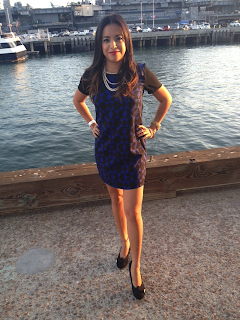 This black and blue geometric print dress was a steal at Francesca’s for only $35! When I first saw it I knew I needed something like this in my closest and had endless ideas on how I would wear it. I stuck with simple accessories, since the dresses design was enough already. I paired it with a shortened pearl necklace and mismatched gold bangles. The black pumps are from Payless, but guess who designed them! Mr. Fierce himself - Christian Siriano from season four of Project Runway. Whenever there’s a major designer working alongside a department store it is the perfect opportunity for you to throw some fancy brand names in your wardrobe. Well, what’s the consensus for outfit number three? Would you wear a dress with crazy shapes or would you keep it simple with a less complex design?